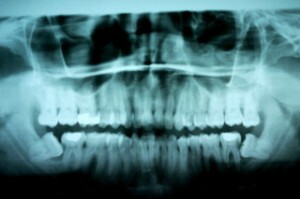 Periodontal disease has developed due to your wisdom teeth. Regular visits to your Placerville dentist are essential no matter what your age, but during the teen years and early twenties it is vital that wisdom tooth progression is tracked. Years of diligent childhood dental care and/or orthodontic work can be undone when wisdom teeth come in where there is no room for them. Impacted lower 3rd molars resulting in decay on 2nd molars as well as localized bone loss (periodontal disease). This patient’s swelling and pain comes and goes from time to time. If left untreated, Ludwig’s Angina can ensue causing air way constriction, bacteremia, septic shock, and death. With local anesthesia and sedation, removal of wisdom teeth is usually a one hour in-office procedure. The longer it is delayed, the more problems will arise, which could include damaging or shifting perfectly good teeth. Make an appointment soon for yourself or your teen to see where the wisdom teeth are in relation to the rest of the upper and lower jaw. The dentists at the Placerville Dental Group have the experience and knowledge to deal with these often pesky last set of teeth. Sometimes, taking them out is the smartest thing to do, and without delay!